Route 173 will be diverted in the Upinniemi military area on Friday 12 February from 10am to 12noon due to an oath-taking ceremony. 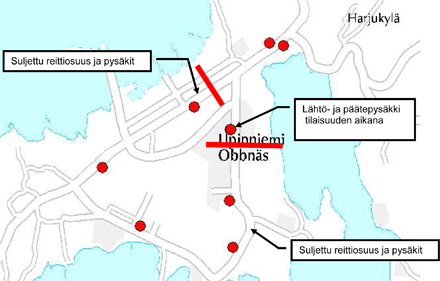 The bus will turn around at the Upinniemi school bus stop ki1004 back to Upiniementie. The map below shows the closed section of route with red bars. I.e. the bus will not run the loop.